Minimalism is a style that avoids excess where quality rather than quantity becomes a deciding factor when shopping. Minimalistic interiors have their charm and current design trends have made this style synonymous with modernity. How to create interiors that are pure in their form, ascetic in color use, and still have a maximum functionality? Check out our ideas and inspirations for a trendy bathroom in a minimalistic style. Minimalist bathroom is austere in form. Structural wall tiles are the only decorative elements in this interior. Ceramika Paradyż’s Esten collection. Go with subdued colors – grey, black, white, or beige will reflect the desired atmosphere best. Install a wall-hung toilet and lavatory that will make the room visually larger. Hide shelves behind a mirror or in carefully selected spots. Hide sockets in countertops or drawers. Install touch-to-open cabinets (this allows to eliminate handles and accentuates the simplicity). Limit the number of shelves in the bathroom to the minimum. Use of bright colors will make the room look larger and cozier. Interesting lamps kept in the color scheme compatible with the remaining finishings will provide an incredible effect to the minimalistic clean-form bathroom. Ceramika Paradyż’s Elanda/Elando collection. 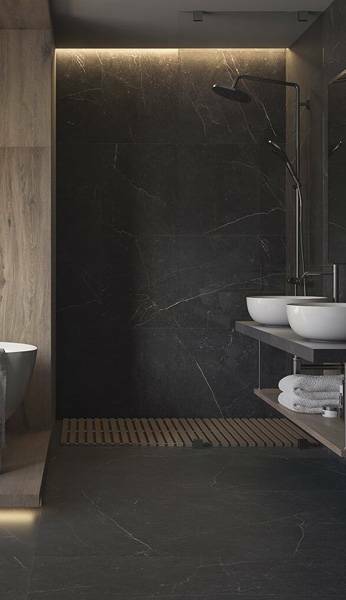 What materials to use in a minimalistic bathroom? Now that we know what the key features of a minimalistic bathroom are, let’s consider what materials work best in such an interior. Moderate use of steel elements as frames for bathroom cabinets and glass as a simple shower wall. The well-balanced arrangement makes the interior simple and functional maintaining its minimalistic nature at the same time. Ceramika Paradyż’s Tequila collection. Anyone who follows the latest trends has surely noticed that concrete is gradually gaining wider application in the arrangements of modern bathrooms. It goes perfectly with minimalistic style as well as glamour style interiors which are full of radiance and splendor. Concrete can be implemented in a bathroom in various forms, such as large-format wall tiles or hexagonal decorative elements, so-called hexagons. 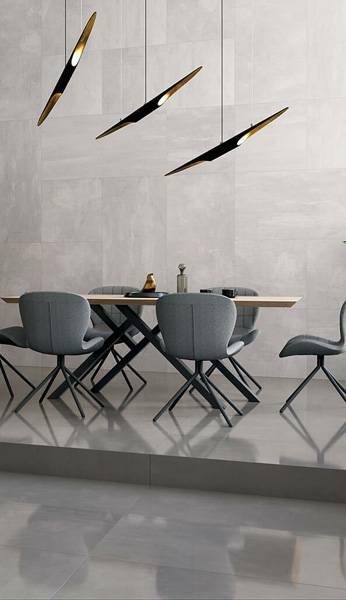 Tiles inspired by the texture of concrete will give the bathroom a cold and austere feel whereas the use of wood-imitating floor tiles will warm up the interior. If we think of using wood as a finishing material in our bathroom, it is very important to think through the wood species we wish to use. Currently, the most popular style is wood with a raw look and clearly visible rings. This is where ceramic tiles manufacturers come to an aid as they offer a wide range of wood-imitating tiles with more or less visible rings that reflect natural wood. Wood-imitating tiles not only look impressive, but are also very easy to care for. Few people like to clean, but we all definitely like when it’s clean. Therefore, nowadays, when every single day is planned almost to the minute, it’s a good idea to look for such solutions that will let us save time. Minimalistic style bathroom has a simple form, a limited number of cabinets or lockers, which will, without a doubt, save us a lot of time that we would otherwise spend cleaning rooms full of equipment and rich decorations. Time we spend in the bathroom should be spent primarily on relaxation and activities related to hygiene, not cleaning. Limiting the number of cabinets and shelves will surely make this easier for us. Minimalistic interiors’ main feature is simplicity which is best achieved through the use of classic geometric forms. For the interior to be consistent, the bathroom’s fittings, furniture, or ceramic should be kept in such style. The less complicated the room is, the easier it is to use it and enjoy it. Let’s not forget what matters the most in a bathroom – functionality. 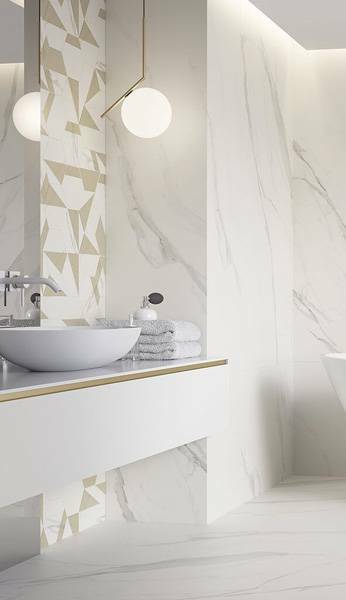 Bathroom tiles with geometric forms make a perfect combination with simple shapes which are fundamental in a minimalistic bathroom. Choosing minimalistic style for our bathroom and its adequate planning gives us a chance to create a beautiful original interior at a lower cost than those incurred when arranging a glamour style bathroom, for example. The use of fewer number of finishing elements in the bathroom generates fewer expenses, which, obviously, translates into lowering the final cost of the interior arrangement. Combination of trendy ascetic look of concrete with intense geometric decorations introduces a lot of life into a minimalistic interior. 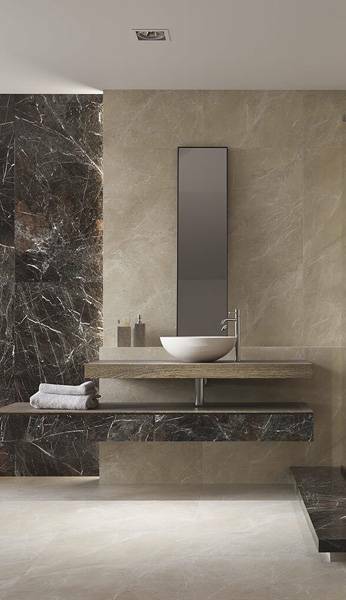 Arranging a minimalistic style bathroom guarantees that even in a few years, it will still be “in vogue”. The belief that simple interiors are always trendy has its followers among those who opt for reliable, “safe”, and timeless solutions. Currently, there are plenty of possibilities of arranging a minimalistic bathroom, which is why it is not difficult to find something that fits our needs and individual preferences perfectly. When searching for appropriate finishing materials, check out the extensive offer of ceramic tiles at the Ceramika Paradyż website.